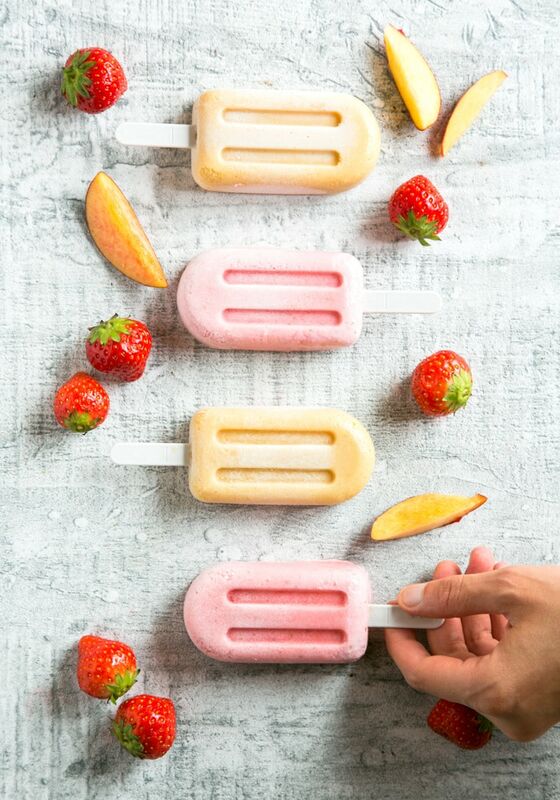 Healthy Nectarine and Strawberry Smoothie Popsicles made with only 4 wholesome ingredients. Awesomely gluten-free, these fruit popsicles are absolutely delicious – the perfect refreshing summer treat. These healthy Nectarine Strawberry Smoothie Popsicles are basically a smoothie on a stick, perfect to enjoy for breakfast, snack or dessert. They’re definitely one of my favorite go-to summer treats. These juicy smoothie ice lollies are super quick to prepare and you can make a big batch at the beginning of the week and have a delicious treat to enjoy whenever you want. 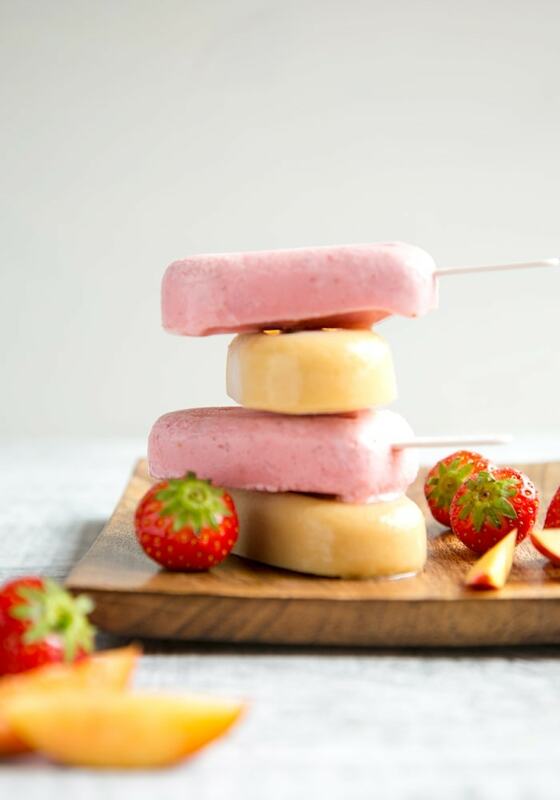 Ready in just 15 min and awesomely gluten-free, all you need to make these popsicles is just 4 wholesome ingredients: nectarines, strawberries, honey, and milk. You can choose any fruit you like to make them, but I personally love the nectarine&strawberry combo. The nectarines are juicy and sweet, and go hand in hand with the tangy flavour of the strawberries. Add a little bit of organic honey to the mix for a sweeter note, and finish off with a splash of whole fresh milk (or dairy-free alternative if you need to). Personally, I always opt for a2 Milk™ when making dairy recipes, or just to enjoy a nice glass of milk for breakfast. 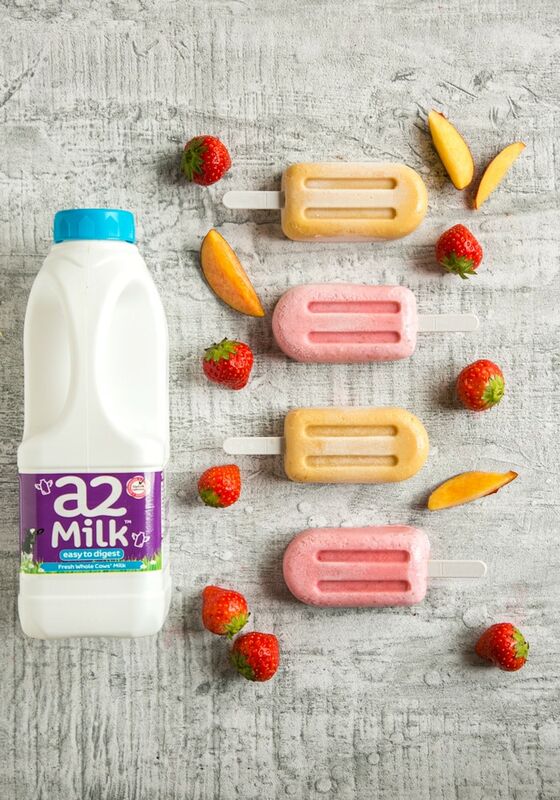 In fact, a2 Milk™, produces milk that is naturally free from the A1 milk protein, which is the one that causes many health issues to people who are dairy intolerant. As you know I’ve been dairy intolerant for over 10 years, but since discovering a2 Milk™ I was able to re-introduce milk in my life, without all the discomfort I used to have, so I highly recommend it. Back to these awesome Nectarine Strawberry Smoothie Popsicles, did I tell you how easy they’re to prepare? The hardest part is probably waiting for the popsicles to be ready to eat! 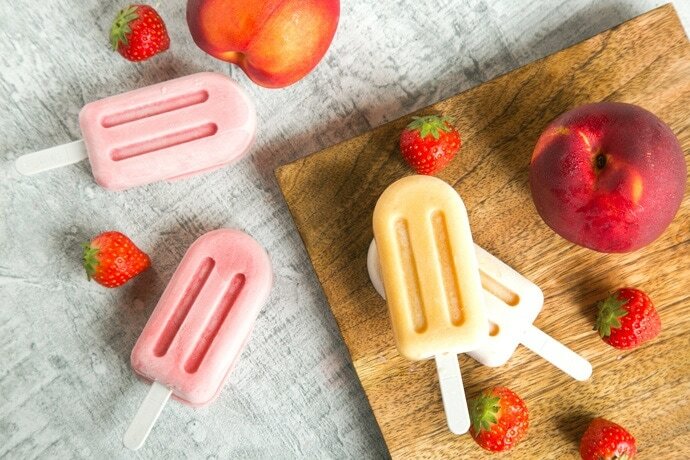 Once you have your strawberries and nectarines all chopped up, all you have to do is blend with milk & honey, and pour into the popsicle molds. Freeze for about 3 hours and…that’s pretty much it. Before you know it these yummylicious popsicles will be all ready for you to enjoy under the sun! 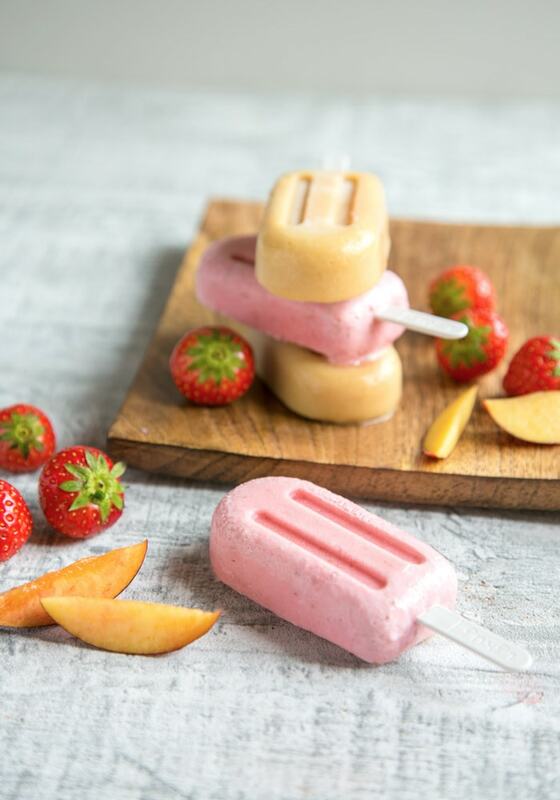 Healthy Nectarine and Strawberry Smoothie Popsicles are gluten-free and made with only 4 wholesome ingredients - the perfect refreshing summer treat. Finely chop the strawberries and nectarines and set aside. In a blender, add in strawberries, half of the milk and 1 tsp of honey. Blend until smooth. Divide the strawberry smoothie among 3 ice lolly molds, put in the sticks and freeze for about 3 hours or overnight. Place nectarines, the remaining milk, and honey into the blender, and mix until smooth. Divide the nectarine smoothie into the remaining 3 ice lolly molds, put in the sticks and freeze for about 3 hours or overnight. Nectarines are my fav summer stone fruit, so sweet & juicy and the smell is heaven so I know I will love these ice pops. My kids would love to have this ones. Also these popsicles are healthy due to fruit, milk and organic honey. Will try this receipe. Thanks for sharing. Its delicious and I am always in love with the delicious smoothies. thanks for sharing. I will share it with the one who can make it for me. These popsicles look awesome and specially when they are made from strawberries and honey…yum!! I am finally trying my hand with various recipes.. And will make a popsicle today for sure.. It has been so hot this summer that I would love to get these made. What pop molds do you use? These look so delicious! Nectarines and strawberries are two of my favorite fruits! Oooh, such pretty, fruity lollies. The kids will love is on those scorching hot days. You have just about put me in a coma. Gosh, those look perfect on a hot day! The combination of nectarines, strawberries, honey, and milk sounds absolutely perfect together! Your smoothie Popsicle recipe sounds amazing! They look lovely! We also freeze smoothies at home to make ice lollies and my children love them! Those popsicles look so good! I haven’t heard of A2 Milk. We have to use lactose-free milk for some of our family members so I’ll check that out. Thanks! Your popsicle moulds are super cute. I love peaches and strawberries together. Perfect summer flavour combination.